Retail signage should visually showcase a brand’s unique personality, as well as create a stimulating and engaging environment for customers. For retail marketers, brainstorming innovative signage ideas that achieve both of these goals for their clients is no easy task. If you’re a retail marketer looking for some serious retail signage inspiration, read on! 1. Create a grand entrance. A retailer’s exterior signage should catch the eye of every passerby. It should be bold, unique, and heavily branded. It should also encourage people to take time out of their busy lives to actually step inside the store. One of the best ways to achieve all of these goals is to create an entrance that is so eye-catching it literally draws people into the store. This could be done by building a uniquely shaped doorway, playing with paint patterns, or getting creative with signage, wall murals, or window graphics. This Adidas store uses the brand’s trademark white lines to actually lead passerby from the street into the store, while this theater uses simple paint to make their entire entryway look exactly like their logo. 2. Add clever, unexpected details. Whether you go all out with your entryway signage or keep it subtle, you should definitely consider playing with smaller design details that will surprise and entertain your retail client’s customers. Use landscaping, lighting, and other architectural features to get creative. For instance, if your client sells art or design supplies, you could position a giant-sized squeeze bottle of paint near a bed of flowers to make it look like the flowers have been squeezed out of the bottle. If your client owns a musical instrument store, why not paint the steps leading up to your doorway to look like piano keys? The point is use the space you have to build something both clever and unexpected that will delight customers. Thanks to the popularity of social media platforms like Instagram, there’s no shortage of both amateur and professional photographers looking for their next share-worthy photo op. So, why not give the people what they want? Install a unique statement wall, art display, optical illusion, or other design idea inside or outside of your retail client’s storefront, and encourage customers to snap a photo and share their location. Biscuit Home, an interior design store in Houston, used the exterior of their building to create the colorful #BiscuitPaintWall. By including the hashtag on a sign next to the wall, the store has managed to accumulate thousands of hashtag mentions. Not only has this tactic driven thousands of consumers to their storefront, but they’ve achieved a social reach way beyond what they would be able to achieve on their own. 4. Play around with typography trends. So many retailers use signage that is nearly indistinguishable from the surrounding competition. 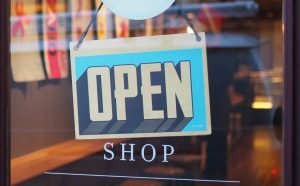 Make your retail client’s storefront stand out from the crowd by using beautiful, unique, and creative typography. Depending on your client’s brand, your choice in typography could range from clean and minimalist to big and bold, or from regal to classic and retro. For some inspiration, check out these signage typography ideas from Pinterest here, here, here, and here. 5. Use eye-catching symbols instead of words. You already know that a picture is worth a thousand words. We believe that this is even more true when it comes to retail signage! While words are important, sometimes the right symbols and images can be even more intriguing for customers. For example, this signage from Sigmund’s Pretzels is about as minimalist as it gets. But for a passerby craving a salty snack, it only takes one look at that pretzel symbol to start thinking about whether or not they should stop in for a snack. For more ideas, check out symbol signage for this engagement ring shop, this alterations store, and this key shop. In all of these examples, the signage is ultra-simple, but highly effective. Even this fun yoga studio sign fits the bill. Need help creating innovative retail signage to help your client stand out from the crowd? Contact SmartLink today to learn more about our retail signage services.